A giant squid seized control of my brain today. I was at work at MLive, editing content for the print editions as usual, and I happened to glance at a book review of "Preparing the Ghost" on one of the pages I handed off to a designer yesterday. I hadn't had a chance to read the review in full, although I knew it was about Marquette author Matthew Gavin Frank's long-form essay on giant squid. So I skimmed the proofreading marks to see if anything big jumped out. Something big DID jump out. This line in the review caught my eye: "The first live footage of (a giant squid) in the ocean wasn't recorded until 2012." What?! My apologies to those for whom this is old news, but "What the $#@^," I said. I know I've seen footage of live squid in the ocean before. So I did some Internet-ing and guess what. 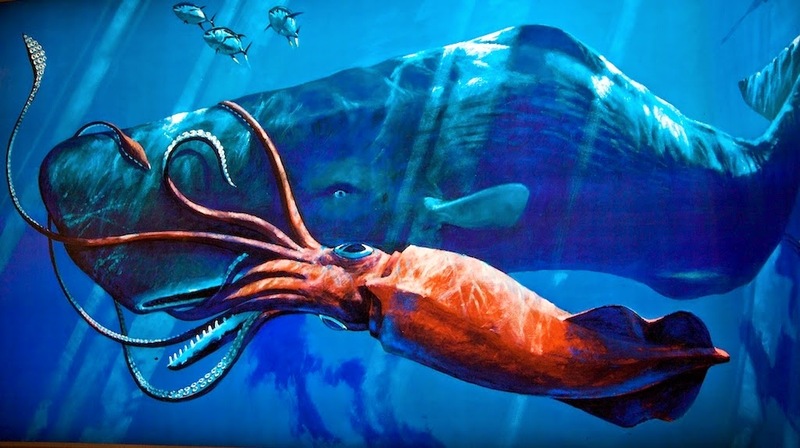 There was no footage of a living giant squid in its natural habitat before 2012. There have been plenty of videos taken of regular squid, but not of their monstrous cousins, the 4o-foot-long ones with eyes the size of soccer balls, tentacles reaching lengths of 25 feet apiece, and beaks that could tear you apart. The video, first aired on the Discovery Channel in a 2-hour special in 2013, was captured by a team of scientists and a Japanese film crew, 2,000 feet beneath the Pacific Ocean two years ago. The crew logged 400 hours and tried all sorts of techniques before they were successful -- including remote-operated vehicles, which proved not to work. Finally, they hit on the idea to use a submersible mechanical limb, lit by a red light that apparently the squid can't see. Once it was in place, they beamed an optical lure (a computer-generated image that mimics the motion of prey) into the ocean to attract the squid up to the light and the camera. The moment the scientists first realized they got the squid on camera is incredible. Since learning all of this today, I'm definitely reading the book "Preparing the Ghost: An Essay Concerning the Giant Squid and Its First Photographer." The stories are just too wild not to share.